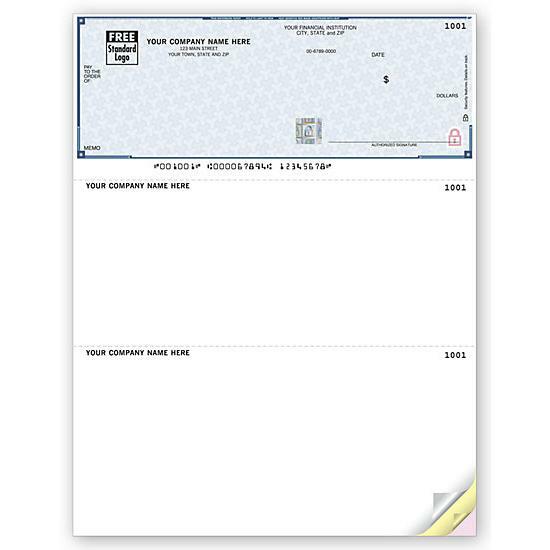 Item#: SDLT228 Size: 8 1/2 x 11"
These laser checks are compatible with Tabs3 ® legal software. 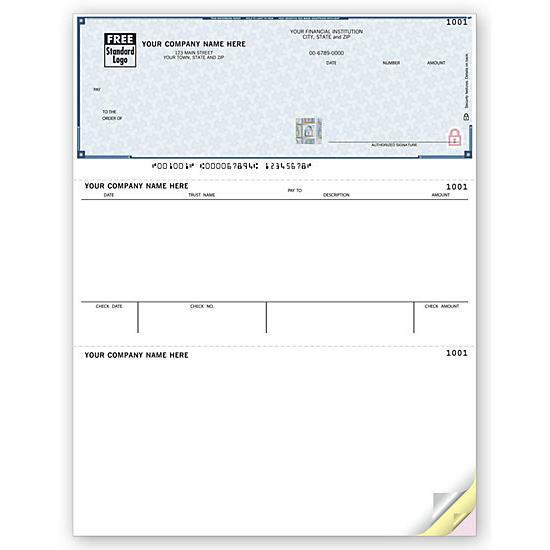 One versatile computer check is all it takes to pay multiple invoices, thanks to detailed tear-off bottom stubs assuring you of proper account credit.Trusted by 7,000 financial institutions nationwide, the High Security Laser Checks offer the highest level of check security and include NEW security features, making it the most secure check available.Deter, Detect and Defend against check fraud with High Security Checks, now with NEW innovative security features! Checks remain the payment method most frequently targeted by criminals. Processing Time: Ships within 3 to 5 working days. Compatible: Sheet format fits all standard laser & inkjet printers; multi-part options include up to 2 color-coded duplicates on separate sheets. Visible Security Features: Heat-sensitive ink, visible embedded fibers, chemical-wash detection area and, true watermark. NEW Security Features! Anti Copy Technology. High Security Checks are made with technology to prevent most copiers from creating a usable copy. NEW Security Features! False Positive Test Area. Detection circle area turns black and gold when tested with a counterfeit detector pen (SP1000). NEW Security Features! Void Pantograph with Verification Grid. The word "VOID" appears when photocopied and the Verification Grid disappears.